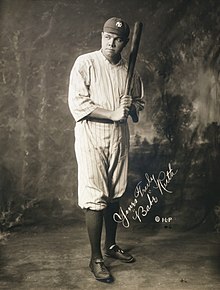 Imreoir daorchluiche Meiriceánach ab ea Babe Ruth a rugadh faoin ainm George Herman Ruth Jr. (6 Feabhra 1895 – 16 Lúnasa 1948). Rugadh agus tógadh é in Baltimore, Maryland. D'imir sé 22 séasúr i Sraith Mhór an Daorchluiche (MLB) (1914–1935). Thosaigh sé mar chaiteoir ciotógach leis na Boston Red Sox, ach bhain sé clú ceart amach dó féin i ndiaidh dul le Yankees Nua-Eabhrac. Áirítear é mar dhuine de laochra spóirt Mheiriceá. "The Bambino" agus "Sultan of Swat" na leasainmneacha a tugadh air. Fuair sé bás i Manhattan, Nua-Eabhrac. Rugadh Ruth do bheirt imirceach ón nGearmáin agus tógadh é i gcomharsanacht bhocht in Baltimore. In aois a 7 mbliana cuireadh Ruth chuig St. Mary's Industrial School for Boys, scoil cheartúcháin, mar ar fhoghlaim sé ceachtanna faoin saoil agus faoin daorchluiche araon ón mBráthair Matthias Boutlier de chuid na mBráithre Críostaí. Sa bhliain 1914, shínigh Ruth conradh mionsraithe leis na hOrioles in Baltimore, ach go gairid ina dhiaidh sin dhíol siadsan Ruth leis na Red Sox. Faoin mbliain 1916, bhí clú tuillte aige mar shárchaiteoir a bhí ábalta buillí baile fada a bhualadh isteach freisin uaireanta, rud annamh i dtréimhse "na liathróide mhairbhe" roimh 1920. Faoi dhó, bhuaigh Ruth 23 cluiche le linn séasúr amháin agus bhí sé ina bhall de thrí fhoireann Bhostúin a bhuaigh sa tSraith Dhomhanda. D'éiligh sé imirt achan lá imeartha agus tugadh cead dó imirt sa pháirc amuigh. Bhris sé an record san MLB le haghaidh an líon buillí baile in aon tséasúr amháin. Bhíodh sé mar nós ag Ruth cuairt a thabhairt ar pháistí in ospidéil agus díleachtlanna. Tharraing Ruth clú air féin mar fhear mór na mban. Ar scor dó, ba doiligh leis obair a fháil a bhain leis an daorchluiche. Tugadh an leathanach seo cothrom le dáta an 6 Meitheamh 2016 ag 17:58.